And, now we’re happy to announce our next contest! 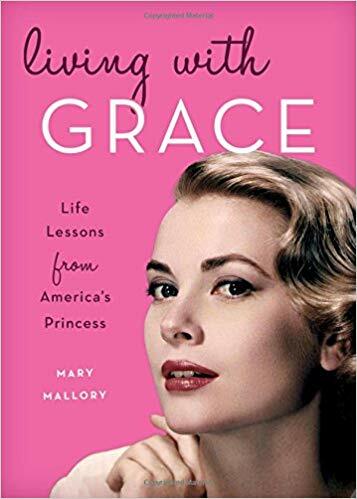 This time, we’ll be giving away EIGHT COPIES of “Living with Grace: Life Lessons from America’s Princess” courtesy of Lyons Press and author Mary Mallory! In order to qualify to win one of these prizes via this contest giveaway, you must complete the below entry task by Saturday, September 1 at 10PM EST. However, the sooner you enter, the better chance you have of winning, because we will pick a winner on four different days within the contest period, via random drawings, as listed below… So if you don’t win the first week that you enter, you will still be eligible to win during the following weeks until the contest is over. We will announce each week’s winner on Twitter @ClassicMovieHub (or via this blog, depending how you entered), the day after each winner is picked at 10PM EST — for example, we will announce our first week’s winners on Sunday Aug 12 at 10PM EST. What do love most about Grace Kelly and/or her films and why? About the Book: Poised, cultured, and unforgettable, Grace Kelly had the aura of a princess, even before she was crowned. She exuded grace, polish, flair, and serenity as a fashion icon, actor, and humanitarian. Living with Grace is a captivating look at this elegant woman who has been an inspiration for many and whose legacy enlightens a new generation of fans. Seldom seen photos and outtakes are complemented by inspiring quotes from and about Grace and the famous roles she played. These words and images highlight what made her so iconic on film and in life. This entry was posted in Books, Contests & Giveaways, Posts by Annmarie Gatti and tagged author Mary mallory, grace kelly, living with grace: Life Lessons from America's Princess. Bookmark the permalink. I love how Grace always took a stand for her beliefs. Grace Kelly embodied grace and class. Every one of her movies is a classic, and her life after the movies was amazing and so interesting. Grace Kelly! Wow…beauty and style. Cool quintessential Hitchcock blonde! Great in To Catch a Thief, Mogambo, Dial M for Murder, Rear Window. Super regal as Princess Grace. An all time great!!! I love Grace Kelly’s elegance and soft spoken charm! Rear Window is on of my favorites with her in! I love that Grace was more than she appeared to be. Her image was calm, cool and serene. But according to people who knew her, she was also fun, caring and passionate. I also love that she maintained many of her Hollywood friendships even after she became a princess. What I love most about Grace Kelly is her beauty. She was so beautiful with the beautiful face and blonde hair. The second thing I love the most about Grace Kelly is her elegance. The black blouse and white skirt she wore in Rear Window (1954) is the classic example of Grace Kelly’s elegance. I love Grace Kelly because she had real beauty and sophistication. She was also a talented actress that knew a lot about fashion. One of my favorite movies that she starred in is Rear Window (1954). She was not only beautiful but had class and grace. She cared about people and after her acting career ended she did so much for other artists with the Princess Grace Foundation, as well as so many children with AMADE. While I have never seen a Grace Kelly film, I know that she embodies the definition of a star. I would love to win this book to learn more about her. I remember the first summer I lived in the Philadelphia area, I read an article in the newspaper (so, this was a looonngggg time ago 🙂 about Princess Grace. It was only a small blurb about how she was visiting her family in Ocean City, NJ. Now for people that aren’t from this area, you may not know that most NJ beaches charge a fee to visit the beach! After you pay the fee, they give you a “beach tag” that has to be visible, and if you don’t have one, you’re told to leave the beach. The day Princess Grace was visiting with her family, the “tag patrol” asked to see her beach tag. She didn’t have one or had forgotten to bring it. Instead of getting annoyed or angry or saying “DON’T YOU KNOW WHO I AM?” She quietly left the beach to go get a beach tag. She always showed such class and her name suited her perfectly, Grace. I hesitated to post here initially because I know little about Grace Kelly’s acting (except for TO CATCH A THEIF, in which I think she was both hilarious and gorgeous). Then I remembered that she was active, outside her acting, in two areas in which I’m very interested. She actively promoted breast feeding throughout her reign as Princess of Monaco, which began during an era in which the practice had sadly fallen out of fashion in developed nations. She promoted by example, nursing her own babies, and in her writing and interviews. She was also interested in needlework, especially needlepoint. The American Needlepoint Guild has for many years offered in her honor, at their annual seminar, the PRINCESS GRACE AWARD, for excellence of a piece that is worked entirely in the tent stitch. So now I’m thinking I want to learn more about her! What I love most about Grace Kelly is her timeless beauty. She was a beautiful person inside and out come to think of it. Her fashion sense has also influenced many in the fashion world. Although she left Hollywood to become a princess, people still clamor about her onscreen performances even today. She is forever embedded in the silver screen. What do I love most about Princess Grace? Well, if I was shallow, I’d say she’s a blonde beauty, and who can not fall a little bit in love with that? If I wasn’t so shallow, I would point out her aura. She was not always the best actor in her film. But, she was in some great films (Hello High Noon, Dial M for Murder, and Rear Window!). And, she held her own. Whenever she stepped on screen, you knew it. You couldn’t pinpoint what it was. Her voice? Her beauty? Her poise? There was something intangible she brought to the screen that made you believe Carey Grant or Jimmy Stewart or any of the other leading men couldn’t help but be in the same position as you – in awe and slight wonder at the woman standing before you. She was mesmorizing in Rear Window! I have been a fan since seeing that in in the mid 1990s in the theater. I adored Grace Kelly, the ultimate woman of grace, beauty and a wonderful actress. My favorite movie of hers would be Dial M For Murder, a great drama and a great role, Also loved her in High Society and Rear Window,, always enchanted by her presence on the screen. A True Princess, in movies and in life! Grace Kelly is one of my inspiration to make myself better. I will always look up to her beauty, grace and kindness. She’s like my own real version of a disney princess. Grace Kelly…! A literal princess whose life ended way too soon. The best (at least in my opinion) Hitchcock Blonde. I love how she had so much class and rocked every single outfit in every single film she’s ever appeared in. I want to have half as much grace (ba-dum-tshhh) as she had someday. Grace was the epitome of class. When she entered a room in any movie, you could feel her extraordinary presence. She commanded the attention she deserved. I love her grace and elegance! What I loved the most about Grace Kelly was her poise and class. She was, in my opinion, the best Hitchcock blonde, and her life ended way too soon.